Great choice, you deserve it ! Palm Print Multiway Blouson Top is rated 5.0 out of 5 by 1. Delivery Subscription has been added to your bag. There has been a problem adding Delivery Subscription to your bag. Please try again later! “Delivery Made More” gives you 12 months unlimited use of our Standard Delivery, Next Day Delivery, Sunday Delivery, Nominated Delivery and myHermes ParcelShop services for £9.95. You will still be charged for any Supplementary Delivery Charges which apply and the charges will be clearly detailed on the product pages and in your shopping basket prior to placing your order. “Delivery Made More” is only available: to UK customers with registered Fashion World accounts; and for delivery to UK addresses. “Delivery Made More” is only available for purchase online when logged-in to your Fashion World account. However, once you’ve subscribed, you can use it when shopping online or over the phone. Your purchase of a “Delivery Made More” subscription is subject to acceptance by us. By purchasing “Delivery Made More” you understand and accept that the benefits will be available from the date of purchase. You may cancel your “Delivery Made More” subscription at any time within 14 days from the date of purchase by contacting us on 0871 231 4000. If you have not placed any orders with us during this 14 day period, we will issue you a full refund of the £9.95 fee. However, if you have (or anyone authorised by you to use your account has) placed any orders during this 14 day period and incurred any delivery charges, the amount of your refund will be reduced or you may not receive any refund at all. All orders placed are subject to our standard terms and conditions of sale. Delivery will be subject to the terms and conditions for Standard Delivery, Next Day Delivery, Sunday Delivery, Nominated Delivery or myHermes ParcelShop, depending on which type of delivery you choose. For myHermes ParcelShop the £40 minimum order requirement will not apply to “Delivery Made More” subscribers. We reserve the right to amend these “Delivery Made More” terms and conditions at our discretion and we will inform you of any significant changes. 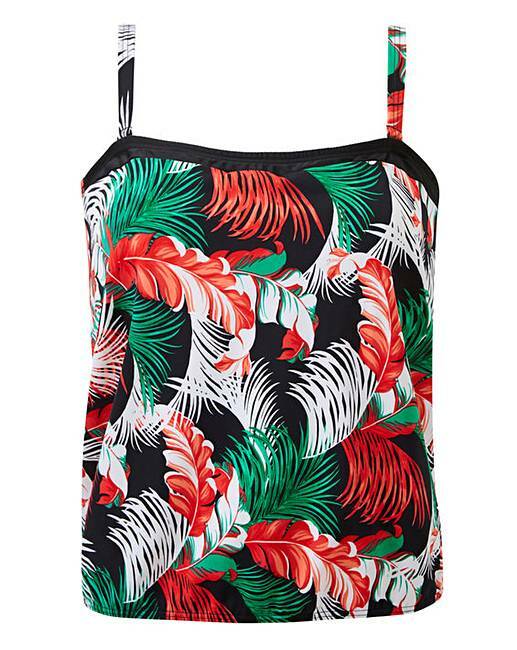 Boasting a gorgeous all-over palm print, this blouson top from Beach to Beach promises to liven up your swimwear collection in an instant. Removable straps allow for an even tan without unsightly tan lines, and the contrasting bust shelf and straps add an eye-catching finishing touch. A must-have in your holiday wardrobe, this blouson top is perfect for making a style statement on the beach this summer! 82% Polyamide, 18% Elastane. Lining: Polyester. Next Day Delivery £3.00 plus your standard charge*. Nominated Day Delivery £3.00 plus your standard charge*. Hermes Parcel Shop £3.50 * Free for orders over £40 otherwise standard delivery charge applied. Direct Express £3.00 (£2.00 if you have already selected next or nominated day delivery) plus your standard charge**. We aim to deliver your order within 3 to 5 working days, providing that the items are in stock at our own warehouse, or by the time indicated if being despatched directly from our supplier. Rated 5 out of 5 by nannygreen28 from Nice tankini Bought this a while ago. Fits lovely. 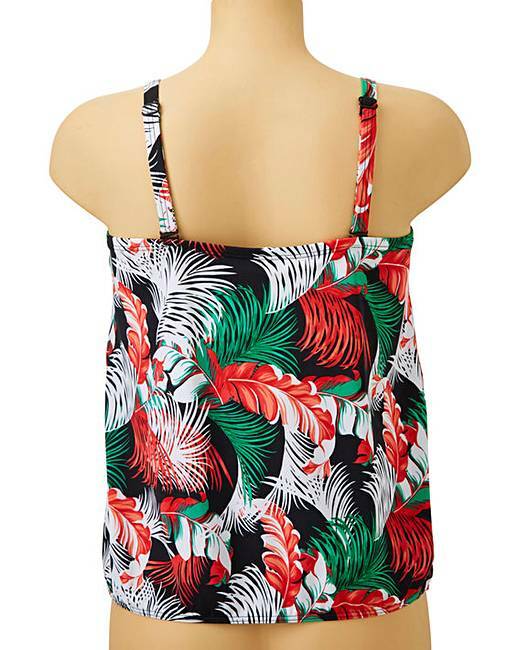 Like these blouson style tankini tops. They hide a multitude of things. Nice and comfortable.